TDWI helps organizations transform data into business value with the power of intelligence. TDWI marketing builds on our industry-leading research and education programs to connect vendors to prospects at a critical moment—the moment that they are actively researching and learning about a new technology. Through our programs, you can reach qualified decision makers across every channel, whether digitally or in person. To provide you with the most effective marketing programs available, help build brand recognition and thought leadership, educate prospects, drive traffic to your website, generate leads, and accelerate sales. Partner with TDWI to Grow Your Business. TDWI marketing programs put your business in front of your ideal customer. We work hard to partner with you to understand your business goals and develop innovative strategies to introduce you to your next customer. As the leading provider of research in analytics and data, we are at the forefront of new technologies, developing quality content and insights your customers are looking for. Our database holds more than 90% of Fortune 500 companies and includes highly qualified leads to reach the decision makers and industry leaders to grow your bottom line. 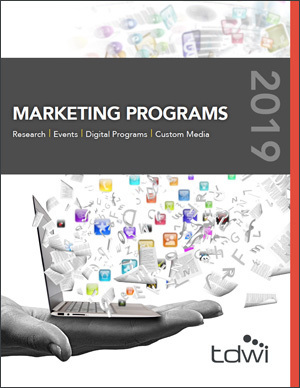 TDWI marketing programs build on our industry-leading research and education programs to connect vendors to analytics and data management leaders as they are actively researching and learning about a new technology. Through our programs, you can reach qualified decision makers across every channel, whether digitally or in person. We help build brand recognition and thought leadership, educate prospects, generate and cultivate leads, and accelerate sales. Analytics and data management are no longer solely the realm of IT. With the advent of software and tools for visualization, reporting, and analysis of every kind of data imaginable, anyone can see and derive value from their data. TDWI reaches hundreds of thousands of business and technical decision makers who are looking for the latest research to help them navigate this intricate network of possibilities successfully. OVER 95% OF THE TOP 100 COMPANIES IN THE FORTUNE 500 ARE IN OUR DATABASES. 39% OF COMPANIES IN OUR DATABASES HAVE ANNUAL REVENUE OF $1 BILLION OR MORE. 75% OF THE CONTACTS IN THE TDWI DATABASES ARE FROM THE U.S. AND CANADA. With more than 1.25 million visits to the TDWI website in the past year, traffic continues to grow. Social networking maintains steady growth as well, with over 100,000 engaged followers on TDWI social media sites.